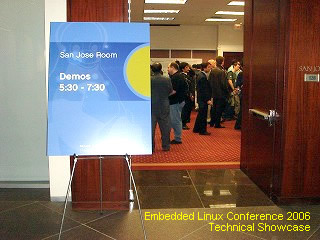 The demo session will happen on Monday evening (Nov. 5) in room Rubi, after the last keynote of the day. It should begin approximately at 5:15 pm and will end at 7:00 pm. See the conference schedule. We will have a “Booth Crawl” for attendees to visit each of the various sponsor booths, which should participate to the showcase too. Drinks and light hors d’oeuvres will be served. 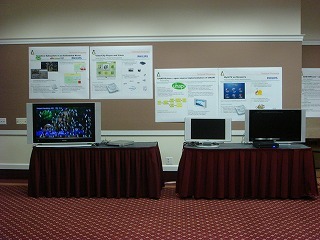 The demo room will be available between 4:30pm and 5:15pm to prepare your demos. 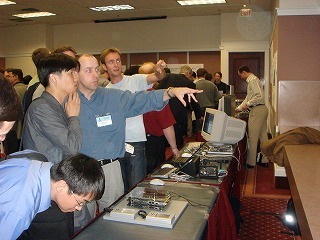 You will be sharing the hall with sponsors and other paying exhibitors, so your exhibition should be of free and open source technology, tools or techniques. Please replace (a) to "@", (dot) to "." 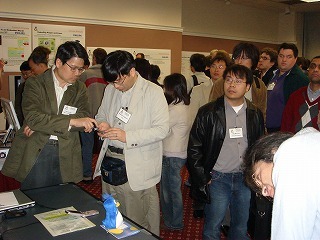 and (dash) to "-"
All demonstrators are requested to prepare a poster to explain the technical outline of the demonstration. You can download the template from this page. CELF will print them out on large size paper (A2 format). The document should be sent to the coordinator by October 28th. Apply early, since space is limited to 15 demo tables! Prepare the poster and send the data to CELF Office and the demonstration coordinator by October 26th. It will be printed out by the conference organizers on A2 size paper. If you do not have a consignee which will be convenient for you, ship them to the Barcino company, following these instructions. Q: Is this opportunity limited to CE Workgroup and/or Linux Foundation members? Q: Would travel funding be available? A: Yes, under some conditions. You can check the Linux Foundation's Community Developer Travel Fund page, and apply if you think you meet their conditions. This page was last edited on 24 October 2012, at 07:53.